‘Onychomycosis’ is a common nail fungus problem, usually not related to poor hygiene! ‘Onychomycosis’ is the medical term for nail fungus – which is usually the result of a living organism that thrives in dark, damp environments such as under and around nails. 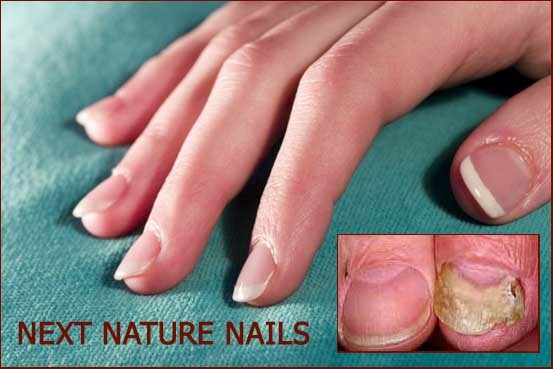 This nail disease is commonly misunderstood: it is usually NOT related to poor hygiene! Fungal infections are very common on both fingernails and toenails. Toenails are more likely to be affected by onychomycosis since it is attracted to a dark and damp environment which is more common on the foot than on the hand. A common cause of ‘onychomycosis’ in the fingernails is… artificial nails!! “Up to 50% of people over the age of 50 have a nail fungus infection to some degree. Approximately 10% of worldwide population suffers from onychomycosis. This disease is commonly misunderstood and left untreated for various reasons. nail fungus, in particular, is notoriously difficult to treat. Onychomycosis is usually a chronic condition that progresses to involve more of the nail and other toes. Even if you lose the affected nail, the nail that grows back is usually also still affected by the fungus. There are some internal medications available by prescription that help fight onychomycosis, but they can have severe side effects such as upset stomach, headaches and liver damages. Also mixing these drugs with other medications can be extremely dangerous. Not to mention the cost. Some of the nail fungus prescription medications can cost well over $1000 by the time treatment is complete. Studies show that there is only 35-50% complete cure rate after 72 weeks of using these prescription medications as a nail fungus cure. Topical medications are helpful in treating early small infections. They just aren’t capable of penetrating the nail to reach all of the fungi, so most prove unsatisfactory as a nail fungus cure. • Onychomycosis in fingernails is often due to artificial nails! • Onychomycosis in the hands of children!